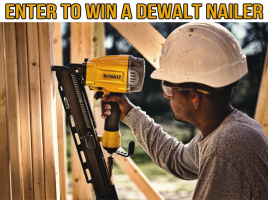 TOWSON, MD (December 4, 2017) – DEWALT® celebrates trades this holiday season. 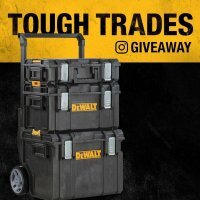 Starting today, DEWALT will give away tools for a variety of trades on its DEWALT Instagram page. 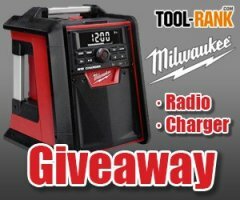 The #ToughTrades giveaway is dedicated to the people who are employed in woodworking, electrical and plumbing, and mechanical industries, concrete and masonry professionals, metalworkers, and general contractors. DEWALT is committed to providing these professionals with products that deliver the performance they need to get tough jobs done each and every day. It is pretty common to find yourself working on a jobsite with less than ideal lighting conditions. Even when supplementing the light you will often find yourself working within the shadows. 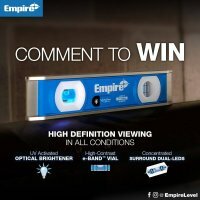 To lessen your chances of making mistakes, Empire Level has come out with a new line of lighted levels. They are so eager to show off their goods they are giving a new em95.10 TRUE BLUE UltraView Magnetic Torpedo Level to two lucky winners. 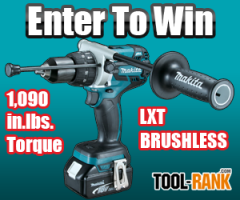 Tool-Rank is happy to be teaming up with Makita this month to give away their brand new 18V Brushless Hammer Drill/Driver. The Makita XPH07 delivers the most torque in its class at a jaw-dropping 1,090 inch pounds. Not only is it powerful, but Makita packed in all kinds of fancy technology that ensures that you get the most runtime out of your tool. To learn more about the XPH07 be sure to read my initial write-up on the new hammer drill. It's giveaway time. 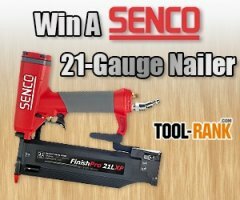 This month Tool-Rank has teamed up with Senco to giveaway a brand new product, their new 21-gauge FinishPro Nailer. When an 18-gauge nailer is too big, and a 23-gauge is too small, Senco says their new 21-gauge nailer is just right. It's the first of the month again and you know what that means; it's time for another amazingly awesome Tool-Rank Giveaway. 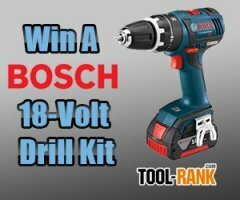 Joining us this month is Bosch Tools, and they are graciously providing their new HDS182-01L 18V EC Brushless Compact Tough ½-Inch Drill/Driver as the prize for one lucky winner. 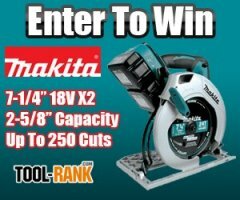 I am excited to announce that Makita has joined in on the giveaway fun and is offering up their brand new 18V X2 (36-volt) 7-1/4-inch Cordless Circular Saw for this month's giveaway. This saw gives you the power of a corded saw with the portability of a cordless by using two 18V batteries to give you a total of 36-volts of power. The added power that this saw offers also allows it to use a standard 7-1/4-inch saw blade rather than a typical 6 or 6-1/2-inch blade. One of the modern tools that makes life a whole lot easier is the cross-line laser level. If I put together a list of tools that every DIY'er should own, the cross-line laser would be on that list. 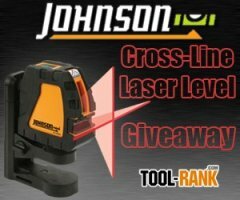 So needless to say, I am happy to announce that this month Tool-Rank has teamed up with Johnson Level to giveaway one of their brand new 40-6650 Self-Leveling Cross-Line Laser Levels. The folks over at Milwaukee Tool have been cranking out all kinds of awesome tools this year, and many of their cordless models feature the latest in cordless technology. 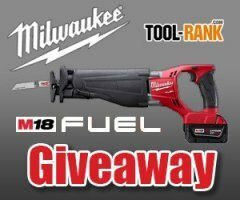 One of those awesome new tech filled tools is their M18 Fuel Sawzall Reciprocating saw, which Milwaukee Tool has donated for this month's giveaway.